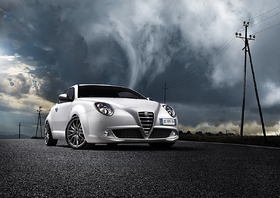 The Alfa MiTo's 145-hp engine produces less than 130g/km of CO2. BALOCCO, Italy -- Alfa Romeo will charge a 600-euro (about $900) premium for MiTo variants equipped with parent Fiat S.p.A.'s new MultiAir fuel-saving technology. The MiTo is the first car to offer the variable valve timing system that Fiat considers a breakthrough because it provides more power while decreasing CO2 output and improving fuel economy. In most cars, an increase in power means higher CO2 and worse fuel economy. In Italy, a MiTo with MultiAir will start at 17,400 euros. MiTo variants with MultiAir go on sale this month in Italy, France and Germany. The rest of continental Europe gets the technology in October. “We expect the MultiAir to be a technological breakthrough for gasoline engines that rivals what the common-rail did for diesels,” Alfa Romeo CEO Dario Cravero said. The arrival of the common-rail diesel led to a massive sales increase for diesel-powered cars in Europe. Diesel represented about 20 percent of total sales in western Europe in the late 1990s. Last year, diesels accounted for 52.7 percent of all new-car sales in the region. Fiat created the common-rail technology but sold it in 1993 to German supplier Robert Bosch GmbH to industrialize. The common-rail diesel debuted in 1997 on the Alfa 156.